Mayor Kevin Faulconer on Monday threw his support behind a hotel tax increase to fund expansion of the San Diego Convention Center, street repairs and homeless services. 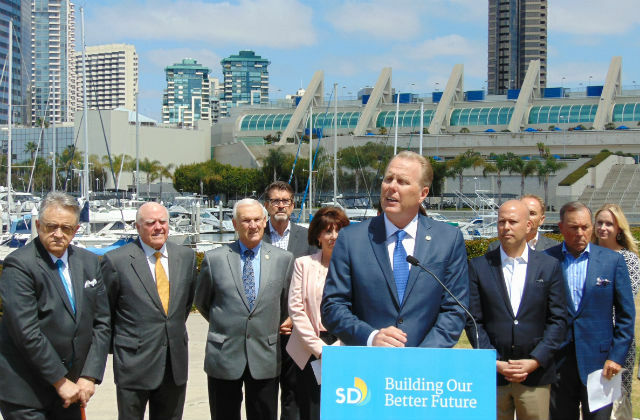 Faulconer, who was joined by hotel and tourism officials at a press conference outside the center, said he will ask the City Council to call a special election in November. The proposed measure would raise the transient occupancy tax paid by hotel guests from 1 to 3 percentage points depending on the area of the city. The expansion could cost up to $700 million and take four years as construction is scheduled around convention activity. The project would be financed with a bond issue, but the increased tax revenue would generate funds to pay off the bonds. In the first full year, the tax would generate an estimated $53.7 million, with $33.7 million earmarked for the convention center. The remaining tax revenue would be used to fund homeless programs and infrastructure repairs, with the mayor committing to spend $10 million annually on each. The ballot measure is similar to one backed by the Chargers last November, but in that case the increase was more and the funds would have gone entirely to a new stadium that could also be used for some convention activities. That measure was defeated, but Faulconer said it is now the “right moment” to present a different ballot measure. “We have everybody working on the same page. We haven’t had that before,” he said. Joe Terzi, president and CEO of the San Diego Tourism Authority, said the convention center has a $1.1 billion annual impact on the city, but thats can’t grow without an expansion. He said the hotel industry believes the benefits of an expansion far outweigh the added costs for guests. “Because of the center’s limited size, San Diego cannot stay competitive with other convention destinations and every year misses out on major business opportunities,” he added. The $10 million earmarked annually for reducing homelessness would grow over time as hotel stays increase. “A new continuing source of city funding is essential to overcome one of the biggest challenges to addressing homelessness — limited resources for permanent supportive housing and additional homelessness programs,” said Richard Gentry, president and CEO of the San Diego Housing Commission. Representatives of Comic-Con and the lodging industry praised the ballot measure. Mike McDowell, CEO of the San Diego Lodging Industry Association, said his industry supports the plan and is not concerned about the increased cost to tourists.